John and me with the man responsible for teaching us a few chords. The applause was explosive, a prolonged cacophony of shrieks and howls that reverberated throughout our small gymnasium. As teachers attempted to restore order amid bellowing calls for an encore, John and I sat on the stage and regarded the chaos we had created. We had expected to go over well, but never did we anticipate the wave of adoration that washed over us. It was all coming from the end of the bleachers along the north wall, where our eighth grade classmates were sitting. The rest of the student body craned their necks and looked back and forth in silent confusion. We called ourselves The Edward Hannon Band as a tongue-in-cheek homage to our social studies teacher, a transplanted Pennsylvanian whose ample moustache and east coast colloquialisms were amusing to us. Plus, naming a band after someone who isn’t actually in the band is ironically hip when you’re thirteen. Mr. Hannon tolerated our tribute with good humor, though the quirky adoption of his name was not the key to our success. Rather, we won the approval of our peers by penning a folksy lament that pushed all the right buttons. Patrol Today was two minutes and four chords’ worth of self-pity that tapped right into our adolescent angst over being stuck out on safety patrol duty after a long school day. As we were all entering the classic self-asbsorption of our teenage years, it seemed like an important and relevant topic. Given that my very own brother not only taught science and math at our school but also organized the safety patrol, there was an enticing subtext of irreverence as well. The children who walked to and from our Catholic school, which served grades one through eight, arrived and departed via three main arteries along a block-length stretch of Robb Avenue. The most coveted positions were at the intersection of Robb and Elizabeth Street. There, at the bottom of a flight of concrete steps between the church and the elementary building, three patrol members were stationed to handle the heavy pedestrian traffic. The luckiest among them got to operate a long, wooden gate that pivoted on a base to swing out and secure the crosswalk. Working the Elizabeth post was fun, social, and it even made you look important to the younger kids. Much less desirable was the terminus of the block at Main Street, near the far end of the elementary building by the convent. Because only two patrol members were located here and far fewer kids used the intersection, the post was comparatively dull. The minimal activity made patrol duty seem much more like a responsibility, and consequently it was less fun. I got it on West in the middle of May. And I wish I didn’t have patrol today. If the lyrics sound simple, the music was even simpler. Every line of the verses and chorus was the same four-chord progression, as if echoing the punishing tedium of its subject matter. I wish I could lay claim to having done that intentionally, but the truth is that we only knew a few chords. 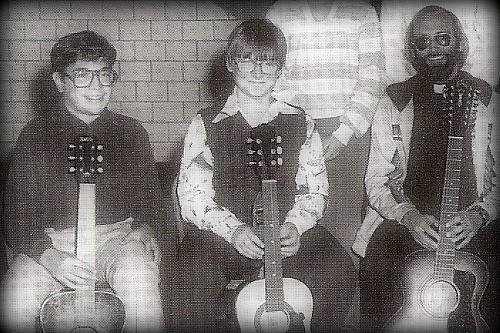 John and I had been taught some rudimentary acoustic guitar skills by Father Paul, a young priest whose full beard and self-darkening eyeglass lenses made him stand out in our parish like a hippie in Mayberry. He had recorded a couple albums of inspirational songs before coming to our church, where he implemented a folk mass. Once, in the course of our religious instruction, he showed us a 16mm film of one of his concert appearances, including a bit in which he wore a top hat and cape to sing Duke of Earl. Soon the church youth were doing calypso strums on the altar, exhorting the congregation to join in on folk renditions of They’ll Know We Are Christians, You And I, and once in a while, a Father Paul original called Renew. With the exception of Do Lord, a fast-paced slice of gospel bluegrass that we found hysterically funny, John and I eschewed the religious numbers in favor of applying our limited skills toward learning a little classic rock and composing our own quirky songs. The annual spring talent show was a natural outlet for our musical interest, and so it was that we performed Patrol Today to a raucous ovation. Despite clearly trouncing the competition on the Applause-o-Meter, we were awarded third place (and if I remember correctly, I think John’s little sister placed above us with a well-executed piano solo). Probably we didn’t even deserve that, but the faculty judges likely felt some pressure to appease the howling mob. It hardly mattered, though – we were instant celebrities. As the end of the school year loomed, our newfound popularity was reiterated in the inscriptions on our new yearbooks. To a great kid that’s gonna have a great band, too…Get your records out soon…Good luck in the future with your Ed Hannon Band…Good luck on your next album…and so on, and so on. It seemed to John and me that we should strike while the iron was hot. With a sure-fire hit in our repertoire, it was time to work up a setlist and capitalize on our smash debut. We set our sights on the church festival, which was scheduled in early June. By some miracle of generosity or perhaps a complete lack of foresight, the festival organizers gave us an early afternoon slot on the stage in the food tent without even requiring us to audition. We were elated. A month of furious rehearsal ensued. We went to a local pawnshop and rented an electric guitar, a bass, and an amplifier. The organizers granted our request for an upright piano in the tent, so we worked up some arrangements with that in mind. The pressure to put together a show fired our creativity, inspiring us to write some new tunes. John wrote a song called Don’t Applaud (Just Throw Money) with the opening line, “We are the Edward Hannon Band…” I cobbled together a lengthy piano instrumental. We decided that we would play a couple covers, but we were confident enough in the strength of our own compositions that the set would be built mostly around original material. We would impress them with our “new stuff,” then we would finish strong with a triumphant Patrol Today. The food tent was mostly empty as we set up for our performance; a small group of volunteers manned the grill along the opposite side. As we tuned up just before showtime, a dozen or so students settled in among the first two rows. They were there to hear Patrol Today. Which we would give to them. After we played the entirety of our set. I don’t recall being too disappointed at the small turnout, but I do remember the terrible weight of dread and embarrassment that descended on me before we had finished playing our first number. Judging by the skeptical looks on the otherwise unemotional young faces of our tiny audience, we were not going down well at all. We good-naturedly ignored a few calls for Patrol Today, sticking to our game plan to make ’em wait ’til the end. The longer we played, the more restless they got, and the more difficult it became to carry on. My face was burning red with humiliation, yet we persisted. Our hour-long set seemed to expand and transcend time itself, transforming into an alternate reality of anxious desperation. Midway through our performance, we barreled through our cover of Chicago’s Dialogue, which ends with the repeated refrain, “We can make it happen.” A caustic voice from the first two rows heckled, “No you can’t!” By the time we reached the end of our set and finally played the hit that made us famous, no one cared anymore. Only the kind ladies working the grill offered words of support. And just like that – pfft!– the brief flame that was the Edward Hannon Band was extinguished. John and I would remain good friends and continue to play a lot of music for our own enjoyment, but the church festival would be our one and only public performance. Tucked among all the effusive praise from fellow students in my eighth grade yearbook is a short message written in a more mature hand. It reads: Lots of luck in school and in whatever you do. If you make a lot of money with the band, send me a few dollars. Mr. Hannon. The check is in the mail, Ed. 6 comments on "The Rise And Fall Of The Edward Hannon Band"
Alas, Father Paul never taught us cowbell. Might’ve made the difference. Every band needs a Didgeridoo and a Jew’s Harp… With these (and the cowbell) you would’ve been unstoppable! Rob, I think you’re on to something there. Several years later, John and I got together with a few other guys and formed a band we called Djibouti. We’d get together at my house to rehearse and record original stuff, covers, and experimental jams. Had we a didgeridoo or a Jew’s harp, I’m sure we would have used it. As it was, we augmented our sound with anything we could find. On some of our recordings, you can hear the percussion filled out with clanging horseshoes and flexed cookie sheets. On one particularly long jam, I went out to the kitchen, made some toast, and rejoined the band with knife in hand to add the unique sound of buttering toast. Yup, coulda been the next FLoyd… The sound of buttering toast isn’t that far off from the way spine tingling sound fx’s of Alan’s Psychedelic Breakfast on Atom Heart Mother! That’s true…wish I’d cracked some eggs as well.